2018 Election Guide: What To Watch, Where To See Results There are dozens of competitive races across the country that will determine control of the House, Senate and governors' seats. Here are the pivotal seats that could unlock what happens. There are dozens of competitive races across the country that will determine control of the House, Senate and governors' seats. Democrats need to pick up 23 seats to take back the House, Democrats need a net gain of two seats to flip the Senate and Democrats are expected to slice into Republicans' 33-16 advantage in governors' seats. NPR will provide live, up-to-the-minute results all night. Our live coverage at npr.org will provide you the latest balance of power in Congress, as well as results from your state and county. You can follow along on Twitter @nprpolitics and Facebook. We'll also have special coverage on the radio starting at 8 p.m. ET/5 p.m. PT on your local public radio station. Find it here. There are key races right off the bat with the Georgia governor's race, the Indiana Senate race and House races in Virginia and Kentucky, in particular. Half of Kentucky closes at 6 p.m. ET, and that includes the key race in the 6th Congressional District. It will draw a lot of attention, but national Democrats caution not to read too much into a loss there, because Trump won it by 15 points. Pay closer attention to congressional races in Virginia and Georgia. GOP Rep. Barbara Comstock in Virginia's 10th District in the D.C. suburbs is expected to lose. If Democrats can flip either or both of the 2nd or 7th Congressional District races in Virginia, those could also be signs of a big night for Democrats. Georgia offers two key races in the Atlanta suburbs — one of which is the 6th District, which was the site of a hotly contested special election last year that Republicans held, but polls show the race is even tighter this time around. On the Senate side, Indiana Democrat Joe Donnelly's fate will likely be critical to Senate control. As for governors' races, Georgia has one of the most closely watched races between Democrat Stacey Abrams, vying to be the first black woman ever elected governor in the country, and Republican Brian Kemp. The race's final days have been marred by controversies over voting access, which Kemp oversees as the Georgia secretary of state. Democratic Sen. Joe Manchin (left) speaks to Jason and Loarie Butcher of Pinch W.Va., last month at an IHOP restaurant in Charleston, W.Va., about his recent vote in the Senate to confirm Supreme Court Justice Brett Kavanaugh. We'll get more answers in the battle for the House with two toss-up races in North Carolina and a toss-up contest in Ohio. 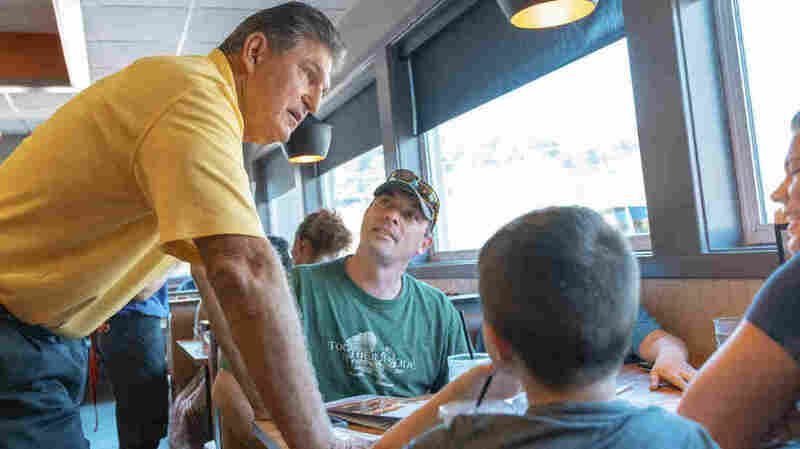 But the marquee event in this hour is the West Virginia Senate race, where incumbent Democrat Joe Manchin, who voted in favor of confirming Brett Kavanaugh to the Supreme Court, is expected to hold on. Democrats need him to win if they hope to have any chance at taking over the Senate, as much of a long shot as it is for them to do that this cycle. In Ohio, Democratic Sen. Sherrod Brown is easily expected to win re-election even in a state Trump carried two years ago, but the open governor's race is a much tighter contest. Here comes the first big wave of races — almost 30 competitive House races, five competitive Senate races and seven big ones for governor. A lot will become known depending on how this hour shakes out, especially about control of the Senate with big races up for grabs in Florida, Missouri, New Jersey and Tennessee. 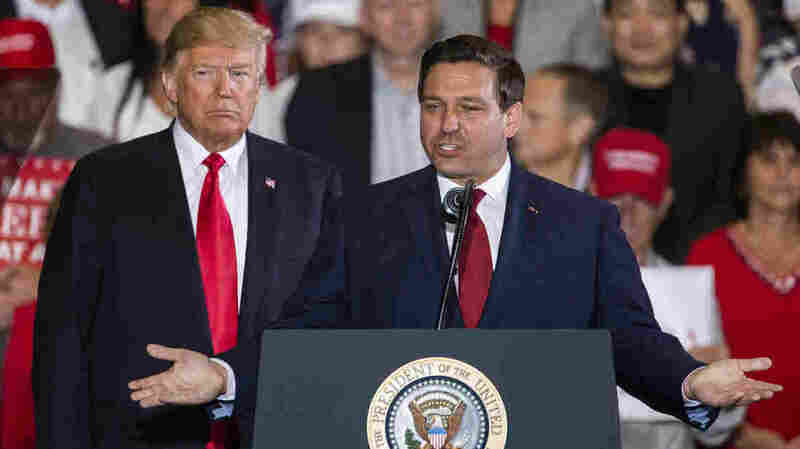 Florida Republican gubernatorial candidate Ron DeSantis speaks alongside President Trump at a campaign rally on Saturday in Pensacola, Fla.
Florida is likely the most crucial state in this the hour, with important races up and down the ballot. The governor's race features Democrat Andrew Gillum, vying to be the state's first African-American governor, and Republican Ron DeSantis, who has hewed closely to Trump. Strategists think Gillum could help buoy Democratic Sen. Bill Nelson in his tough re-election race against outgoing Republican Gov. Rick Scott. Democrats also could flip several congressional seats in the state. 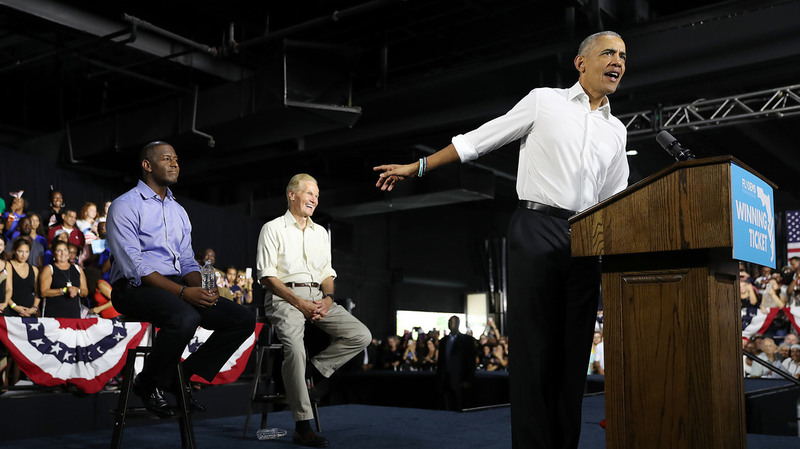 Former President Barack Obama speaks during a rally to support Florida Democratic gubernatorial candidate Andrew Gillum (left) and Sen. Bill Nelson, D-Fla., on Friday in Miami. New Jersey and Pennsylvania are important pieces of the puzzle for Democrats in their hopes of taking back the House. Democrats are expected to flip two open GOP seats in New Jersey, but could oust two other incumbents as well. And thanks to court-ordered redistricting in Pennsylvania, Democrats could net as many as four or five seats there. There are several other competitive gubernatorial races closing this hour, too. Illinois, where more than $280 million has been raised, is Democrats' surest flip. But Democrats also have a surprising chance in the open contest in conservative Oklahoma. At the same time, Republican governors in Maryland and Massachusetts — traditionally blue states — look poised for easy re-election victories. Just one state closes this half hour. Democrats had been looking at contesting a House race here, but that's faded from the list of truly competitive takeovers in the final weeks. But more results will be trickling in to track from the 8 p.m. hour. Just as those big 8 p.m. results become better known and the earlier close races will be decided, here comes another deluge of results. There are almost two dozen House races to watch in this hour across more than a dozen states. There are also Senate races in Texas and Arizona, two big Democratic targets, which will almost certainly be determinative of who controls the Senate. Get ready for quick results from Texas, where most of the polls will have closed at 8 p.m., but final calls won't be made until 9 p.m. ET when polls close in El Paso. Democrats are bracing for a loss in North Dakota with Sen. Heidi Heitkamp as the most vulnerable incumbent. The open Arizona race is a toss-up, but Republicans are increasingly worried, given Trump's closing focus on immigration, that the seat that has been in GOP hands could be won by Democrats. Gov. 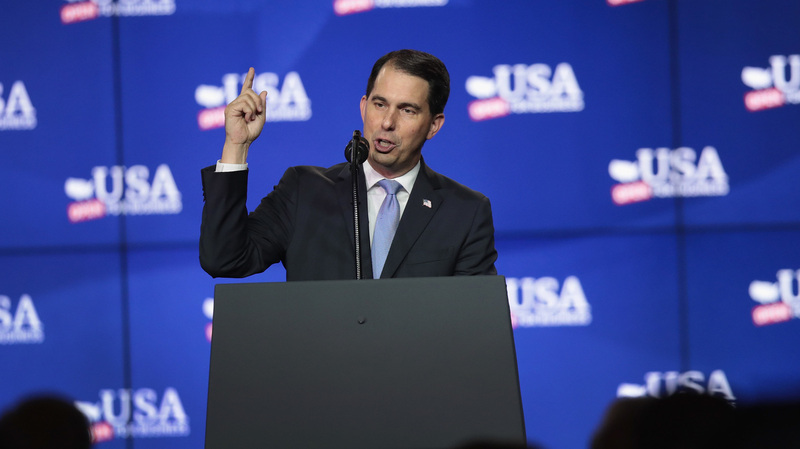 Scott Walker, R-Wis., speaks at a groundbreaking ceremony for the Foxconn factory complex on June 28 in Mount Pleasant, Wis. There are several Democratic House targets, too, especially in New York and Michigan, but Republicans could pick up two Democratic-held seats in rural Minnesota. In governors' races, Democrats have surprising opportunities in open seat contests in Kansas and South Dakota. Democrats are likely to flip the governor's mansion in Michigan, and are hoping to finally oust Wisconsin Gov. Scott Walker, but that race is another true toss-up. Results from the West will begin to roll in, and there are key Senate races to watch in Montana and Nevada. Democratic Sen. Jon Tester is a slight favorite in a state Trump won by 20 points. But Democrats are on offense in Nevada, the one competitive state that Hillary Clinton carried with a GOP Senate incumbent. If Democrats want any chance at making gains in the Senate, Nevada is a must-win. 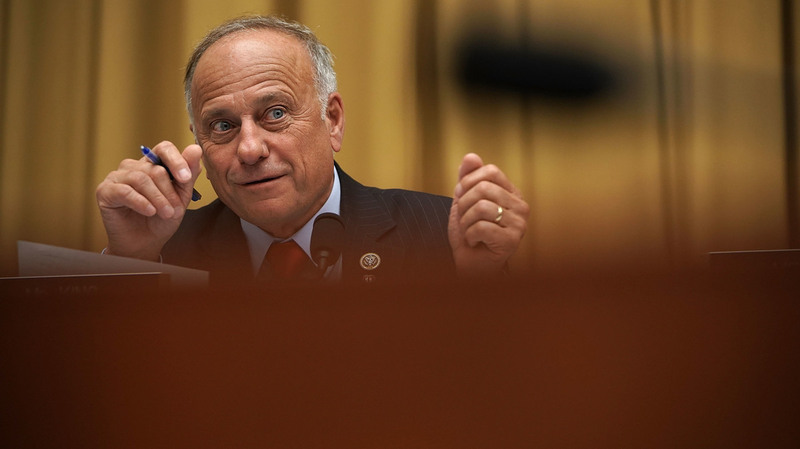 Rep. Steve King, R-Iowa, speaks during a hearing before the House Judiciary Committee on June 28 on Capitol Hill in Washington, D.C.
Iowa offers a toss-up governor's race and several House contests to watch. Democrats expect to flip the 1st District, and the 3rd District with Rep. David Young is a toss-up. A late race to come on the board is the seat held by GOP Rep. Steve King in the 4th District. The controversial lawmaker drew a rebuke last week from the head of the GOP committee tasked with electing Republicans to the Senate for his racially offensive comments and ties to white supremacist organizations. In Utah, get ready for a poll-close call that announces Mitt Romney, the 2012 Republican presidential nominee, as the next senator from Utah. Republicans hope he can help GOP Rep. Mia Love over the line in her toss-up race in the 4th District. This will likely be the earliest that the House will be called. There are seven big House races in California that could help put Democrats over the top for control of the House. Most of them are in Southern California, around Orange County. That had long been a GOP stronghold that flipped to Clinton in 2016. It's an area that serves as a pretty good example of Republicans' problems in the Trump era with highly educated voters in suburban areas, especially women. Democrats are also expected to pick up an open seat that Clinton won in Washington state that has been held by the GOP. But two other Republican women are fighting for their jobs there — Rep. Cathy McMorris Rodgers, House GOP Conference chair, and Rep. Jaime Herrera Beutler, who was swept in with the Tea Party wave in 2010. Herrera Beutler is one of only three GOP Hispanic women in Congress. A second, Ileana Ros-Lehtinen of Florida, is retiring (and a third represents Puerto Rico but does not have a vote). In the governor's race, the incumbent independent, Bill Walker, dropped out of the race just 2 1/2 weeks before the election and endorsed Democrat Mark Begich. This, though, is Republicans' best chance to flip a gubernatorial seat with Mike Dunleavy. Nate McMurray's last name was given as Murray. Aftab Pureval's last name was given as Purval. Patrick Morrisey's last name was given as Morrissey. Bill Schuette's last name was given as Shuette. Allan Fung's first name was given as Alan. Ben McAdams' last name was given as Adams. Asa Hutchinson's last name was given as Hutchison. Additionally, Dino Rossi was incorrectly identified as an incumbent. And Reps. Steve King, Pete Olson, Fred Upton, Carlos Curbelo, Mario Diaz-Balart and Brian Mast should have been identified as incumbents.